Many people lack adequate amounts of foods that are rich in the nutrients needed for health and a productive life. Chronic undernutrition affects some 215 million people in sub-Saharan Africa, or 43 percent of the population (FAO, 1996b). Deficiencies of iron, vitamin A and iodine are also widespread; about 300 million people are affected every year, and a much greater number are at risk of these deficiencies. Malnutrition increases people's vulnerability to infections, causing numerous deaths (see also Chapter 8). In the face of this bleak situation, major efforts are required by national governments and the international community to bring about reductions in malnutrition and micronutrient deficiencies. Increased food production and access are crucial to achieving major nutritional improvement. More foods should be produced that are rich in all the essential micronutrients, available in sufficient quantities and accessible to people all year round. This requires the collaboration of people working in agriculture, fishery, forestry, small animal husbandry, industry, marketing, communications, women's participation, home economics and nutrition. The wide application of proven technologies and approaches in these fields, as well as the development of new concepts, will contribute towards solving nutritional problems. The results of research must be transmitted to farmers, and efforts must be made to build on farmers' indigenous knowledge. Consumers, too, need to be involved and educated on how to prevent nutritional deficiencies. Access to stable and sustainable food supplies is a precondition for the establishment of food security at the household level. Greater and more sustained yields from the farming system will increase the potential access of the household to an adequate diet. Similarly, farming practices that improve the regular flow of a variety of different foods into the household throughout the seasons enhance food security for its members. Promoting appropriate and improved technologies for home preservation and drying of vegetables and fruits at home will reduce wastage and ensure better utilization of fresh produce (e.g. mangoes) available in abundance during the harvest season. Increased food processing through the establishment and strengthening of small-scale agro-industries can contribute to the year-round availability and variety of micronutrient-rich foods in rural and urban markets. Agro-processing industries will not only even out seasonal price fluctuations, but will also create jobs and incomes from such activities as processing, storage, distribution and marketing. Agro-processing will also stimulate demand for farmers' crops and products and give consumers additional choice. · nutrition education to encourage the consumption of a healthy and nutritious diet year round. Some of these strategies are discussed in this chapter. Diversification must entail management and generation of resources in such a way that all the various measures undertaken collectively work to improve the livelihood of the rural poor. Traditional farming systems already use a diversity of crops in both mixed and relay intercropping as well as integration of crops with livestock and/or aquaculture. Research on cropping patterns and rotations is generating improved methods to ensure greater and more sustained yields. A holistic approach to research on farming systems, combining knowledge of socio-economic constraints and a better understanding of small farmers' conditions, should help in finding solutions. For small-scale producers, mixed cropping can be associated with potential yield improvements and monetary advantages as well as positive implications for food security, dietary balance and nutrition. Mixed cropping reduces the risk of crop failure. It can also reduce the need for expensive inputs if crop residues from leguminous intercrops, supplemented where appropriate with rock phosphate, are returned to the soil. Mixed and/or rotational cropping offers increased protection from disease and pest damage, thus potentially increasing profitability and income. All of these attributes reduce risk in the food supply system and thus favourably influence food security. Farming systems based on mixed cropping can extend the harvesting period and help to alleviate seasonal food shortages, thus enhancing the stability of household food access. They can also reduce erosion risks by providing increased soil cover and additional crop residues for use as green manure and mulch. Such characteristics offer gains in sustainability and in stability for the food supply system. The choice of intercrops usually includes legumes and/or oilseeds such as melon seed, groundnut, soybean or sunflower, together with cereals as the dominant crop. In terms of dietary balance, grain legumes, or pulses, contain more protein than cereals and about ten times as much protein as most roots and tubers (Table 22). More significantly, in composition the proteins in cereals and legumes are complementary to each other. Proteins are not all equally effective in promoting growth. The quality of a protein is determined by the kind of amino acids it contains and the proportion in which they are present. Good-quality proteins contain all the essential amino acids in proportions capable of promoting growth when they are the only proteins in the diet. Such proteins are known as complete proteins or proteins of high biological value. All animal proteins are complete proteins, and if eaten in adequate amounts they meet all a person's protein needs. Proteins from vegetable sources, such as beans, contain all the essential amino acids, but contain one or more of them in insufficient quantity to meet the needs for growth. Bean proteins are generally rich in lysine, an amino acid often deficient in cereal proteins, and legume proteins are therefore valuable supplements to cereal-based diets. Table 23 shows the amino acid composition and amino acid score of wheat and chickpea (Cicer arietinum), separately and in combination. An optimal protein quality can be obtained by combining wheat and chickpea at a ratio of approximately 2:1. Source: FAO/United States Department of Health. Education and Welfare, 1968. The total protein content of different legumes varies widely, from around 12 percent for some varieties of chickpea to over 35 percent for high-protein cultivars of winged bean (Psophocarpus tetragonolobus) and soybean (Glycine max) (Table 24). Protein content also varies widely among different varieties of the same species. For example, the protein content of pigeon pea (Cajanus cajan) can vary from 13 to 20 percent, depending on the cultivar and the conditions of cultivation. Source: Siegel and Fawcett, 1976 (quoted in FAO, 1989f). a Amino acid score = amino acid content in wheat/chickpea mixture - amino acid content in ideal protein (egg) x 100. Source: Vietmeyer, 1975 (quoted in FAO, 1989f). The diversity of food supplies offered by mixed cropping systems accords well with nutritional security, especially since the young leaves of many grain legumes, such as cowpea, are also utilized as a green vegetable, providing essential minerals such as calcium and iron together with useful amounts of vitamins A and C. Table 25 lists some specific nutrients found in the major plant groups. Farming systems research can contribute to the nutritional wellbeing and food security of households in a number of ways. With its comprehensive, interdisciplinary nature and its aim to improve the viability of small farms, such research is geared towards promoting sustainable livelihoods. It also includes a priority focus on increasing household food production and improving the assets of the farm household. Farming systems research is directed towards improving the access of farm households to food and income through interventions related to choice of crops and cropping practices, increased use of small livestock, development of labour-saving technologies and improved storage and processing techniques. Thus strategies to encourage food diversification, such as promotion of mixed cropping technologies (including systems integrating crops with livestock and/or aquaculture), should include support for farming systems research and for the efforts of adaptive research planning teams which work directly with farmers in developing locally appropriate systems of integrated farming. Specific emphasis should be given in farming systems research to increasing the micronutrient output of agricultural systems and developing effective storage and preservation techniques for fruits and vegetables that can be employed at the household and community levels. Note: The diets of vulnerable groups may be low in ail these nutrients. a Particularly high nutrient values are found in the hull. Improved agricultural practices for a wider variety of food crops, once disseminated and accepted by the producers, often need support if they are to be widely adopted. For the integration of nutrition objectives into farming systems research, such support may be needed at the policy level. Actors involved in providing support may include government agencies through extension services, together with financial institutions, agricultural banks, farmer groups, fertilizer and seed companies, food industries and other private-sector agencies who may wish to profit from policies for food diversification. The aim must be to provide timely and appropriate inputs, advice and assistance to farmers and producers to maximize the returns and minimize the risks arising from adoption of new strategies. Development of improved seed, together with advice on cultural practices and required inputs, must generally be accompanied by increased access to low-interest credit and greater security of land tenure to reduce risks in marginal areas. Action will also be required to ensure effective demand and marketing. Smallholder farmers are profit maximizers and will adopt improved technologies if they are not too risky and are profitable at an early stage in the adoption process. Risk is perceived not only in terms of monetary returns, but also in terms of the stability and sustainability of the household's livelihood, including access to food. The adoption of strategies to improve the productivity of mixed farming systems, if successful, will create an increased supply of a variety of foods in excess of the immediate demand for food within the producer communities. Therefore, before a food diversification strategy is undertaken, it will be necessary to assess and ensure marketability of excess products. Consumer surveys regarding the promoted crops will be required, together with advocacy and nutrition education to stimulate demand among urban groups, who may have become unfamiliar with some traditional foodstuffs. The United Nations University Institute for Natural Resources in Africa (UNU/INRA) has commissioned a series of studies in 14 African countries on indigenous food crops and other useful plants, to determine people's knowledge of indigenous crops, the use they make of them and the preparations that are made from them. The aim of the surveys is to provide data for determining the status of, and priorities and strategies for, research and training related to indigenous food crops. Such information would be useful in improving cropping systems utilizing indigenous food crops; in planning to enhance sustainability, to reduce risks of crop failure, to diversify production to meet farmers' food needs and to ensure genetic conservation of indigenous African food crops; and in promoting improved methods of cultivation, processing and preparation. In the case of small-grained cereals such as millets and sorghum, improved processing techniques may be necessary to provide products for urban housewives, who have become used to the convenience of rice and of wheat-based baked products such as breads and biscuits. Development of appropriate snack foods based on a wide variety of crops will help provide a market to absorb anticipated surpluses. In addition, widespread dissemination of nutritional information about these products should accompany their marketing. Many of the foodstuffs produced in diversified farming systems, such as roots and tubers, plantains and bananas, and fruits and leafy vegetables, are highly perishable. As their production is promoted, therefore, transport and marketing facilities need to be enhanced to avoid post-harvest losses, whose high cost is inevitably passed on to the consumer. Agricultural policies favouring diversification should ideally entail a review of all sectors of the food chain from production to consumption, as well as mobilization of support at the national, district and community levels through producer and consumer interest groups. In many agricultural communities, people rely on one main staple crop whose seasonality implies a period of food shortage, usually referred to as the lean or the hungry season. Home gardening can often supplement family food supplies during lean periods and can generate added income when other sources of employment and income may be limited, provided enough water is available. Home gardens have mostly been maintained by women, who often water and manure them from domestic wastes and use them to produce early crops such as green maize and the fruits, spices and vegetables needed to prepare relishes. Home gardens are labour intensive, but as they are usually close to the house, the labour required can be combined with home and child care responsibilities. Children are often responsible for carrying water and for simple maintenance work, and they may also be given a few plants or a small area to tend. Support of home gardening through horticultural training and nutrition education at school, including the establishment and maintenance of a school food production garden, will provide useful training in intensive land management for the next generation. Home gardening is quickly taking different forms to suit individual lifestyles and work patterns. For example, urban dwellers grow maize in the backyard and quite often in the front garden as well; busy traders plant bananas behind their roadside stalls and scatter tomato seeds in damp areas around their compound living area; and children bury mango seeds in rubbish heaps and in drains at the side of their houses. Gardening is often rather haphazard and disorganized at this level, with chickens and goats competing for the harvest, but the intention and interest in home gardening are there, waiting to be harnessed. Unfortunately, home gardens have rarely received official recognition, and families often lack the necessary resources, knowledge and inputs to produce crops as effectively as possible. A survey in Ghana indicated that traditional home garden farming systems have a number of major constraints which need to be removed if the systems are to be successfully promoted (Asare, Oppong and Twum-Ampofo, 1985). Important factors to consider in encouraging the expansion of home gardens include security of land tenure to facilitate long-term investment in home gardens and better extension services, including credit, to promote the wider establishment of home gardens and improve their management. Traditional home gardens continue to be important sources of micronutrients for rural communities. Poor people obtain most of their nutrients from food plants, which are cheaper and more accessible than animal foods. In humid tropical countries, green leafy plants such as Amaranthus spp., Corchorus spp., Bidens pilosa, Gynandropsis spp., Celosia spp., Basella spp., Solanum scabrum, Solanum americanum, Hibiscus sabdariffa and Vigna unguiculata often grow wild and spontaneously. Traditionally, they have been consumed as leafy vegetables when climatic conditions have made the cultivation of exotic vegetables more difficult. The leaves of these plants tend to be good sources of protein, phosphorus and iron as well as vitamins A and C and in some cases B-group vitamins. In many cases they are of higher overall food value than introduced vegetable species, for example cabbage or tomatoes. Table 26 shows the nutritional content of some green leafy vegetables widely used in Africa. 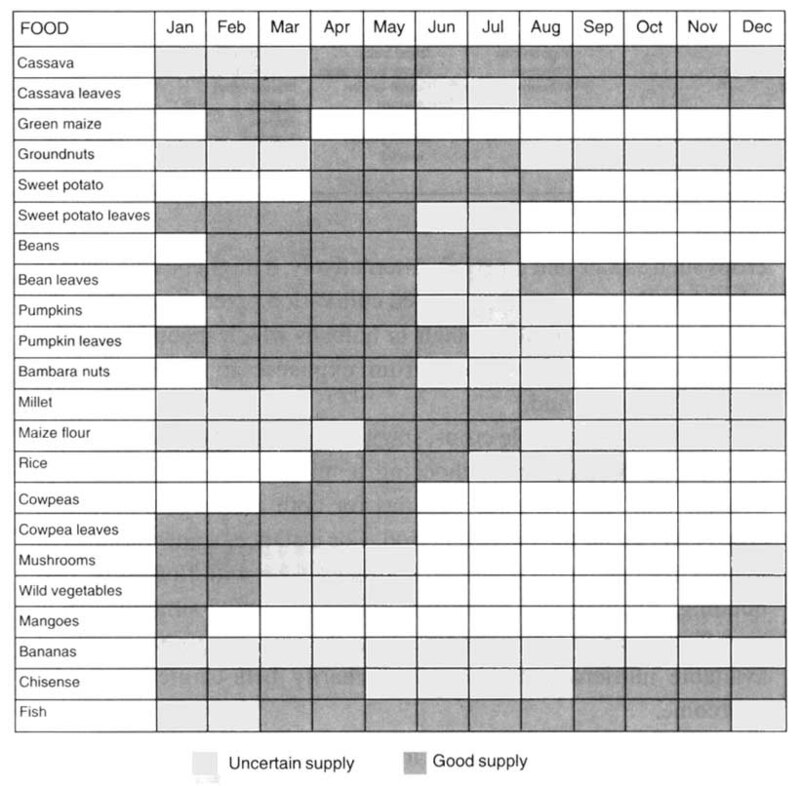 Through careful selection, a range of fruit and vegetable crops can be cultivated throughout the year to provide a constant supply of micronutrients (see Figure 19). For example, yellow and orange perennial fruits (e.g. mango, papaya, cape gooseberry and guava), fruit vegetables (e.g. tomato, pumpkin, squash, gourd and eggplant), some root vegetables (e.g. carrot and yellow-fleshed sweet potato) and most dark-green leafy vegetables are generally moderate to good sources of vitamins A and C. Also, some leaves and fruits produced by local indigenous trees are consumed in rural areas and are rich in micronutrients, e.g. guavas and loquats. Some sources of nutrition from the home garden are given in Table 27. Some staple foods also have a role as sources of micronutrients. For instance, leaves of roots and tubers are valuable sources. In many countries of the African humid tropics, leaves of cassava (Manihot esculenta) are also consumed. Millets are rich sources of iron in comparison with other cereals such as wheat or maize. Fruit and vegetable cultivation presents rather different challenges under low-temperature conditions such as those found in the remote highlands of Ethiopia or Lesotho. In such areas, efforts to extend the production of leafy vegetables into the winter season, for example, need to be based on the selection of cold-tolerant cultivars of Brassica crops such as kale and mustard. Alternatively, it might be advisable to adopt locally appropriate protected cultivation practices, such as the use of simple low plastic tunnels or hotbeds which accumulate solar heat and shield crop plants from exposure to extremely low temperature and wind. Source: Adapted from Thuvesson, 1988. Source: Adapted from WHO/UNICEF, 1985. For fruit and vegetable crops, staggering planting dates in the case of short-cycle crops and choosing a mixture of early maturing, average and late-maturing varieties for both annual and perennial crops can extend the harvest period. For instance, some varieties of mango tree can be harvested three times a year, with flowering, first budding, ripening and harvesting stages occurring simultaneously on different parts of the same tree. Thus the problem of seasonality of available nutrients, in this case primarily beta-carotene, can be overcome. The role of women in home and community gardens is of special importance. In addition to being responsible for producing crops on small plots of land, women, especially those who are elderly, often have good knowledge of indigenous species of green leafy vegetables; they know how to prepare them and how to preserve both seeds and produce. In local markets, the main vendors of these crops (fresh or dried) are often women. Extension services unfortunately tend to focus on the major field crops. Improved planting materials, better cultivars and advice on cultural practices are rarely offered to cultivators of home gardens. Since women do the bulk of the work and are more conscious of and concerned with the nutritional needs of the family, extension advice, credit and agricultural inputs should be provided to them for maximum benefits. The organization of women's groups should be promoted to facilitate their access to inputs, to improve the efficiency of their work and thus to improve the diversity and productivity of gardens. It is important to distinguish between traditional gardens, which are cultivated independently of any intervention, and promoted gardens, which receive external assistance. Many gardening projects, especially those that promote home gardening for nutritional and income-generating benefits, are supported by external donors and non-governmental organizations (NGOs). The involvement of ministries of agriculture has generally been limited, as horticulture is still given a low priority in overall agricultural development programmes, and home gardening, in spite of its potential output, receives even less attention. Consequently, few agricultural extensionists have been trained in gardening techniques, and even fewer in mixed tropical gardening. Still fewer have the knowledge to promote better diets and nutritional practices. The neglect of gardening in development strategies is partly explained by the paucity of data on the output of traditional home gardening systems expressed in quantitative and monetary-equivalent terms which could demonstrate a significant contribution to economic output and national development. As a result, most agricultural and research programmes tend to underestimate or discount the actual or potential importance of home gardening as a food security strategy, and in particular as a strategy for meeting micronutrient needs. However, as more evidence showing the social, economic and nutritional benefits of home gardening is becoming available, some governments and the private sector are showing renewed interest in gardening activities. Case-studies from Bangladesh and Central America that examined the socio-economic aspects of home gardening and its contribution to family consumption and income provide strong evidence that home gardening has significant economic benefits and that it can be a viable strategy for increasing food supplies for family consumption (Marsh, 1994). In an integrated nutrition/home gardening programme supported by Helen Keller International in Bangladesh, overall vegetable consumption increased by 30 percent, with home gardens supplying 80 percent of vegetables consumed by the family. As most of the income earned from sale of home garden produce was spent on food, the prevalence of malnutrition among children of participating families was also reduced. In a study in Honduras and Nicaragua, the gardens supplied a significant proportion of fruits and vegetables, legumes, roots and tubers, coffee, tea and medicinal plants for home consumption. The combined benefits of home consumption, income earned from sale of garden produce (25 percent of total average income in Bangladesh, although wide variation was recorded in Honduras and Nicaragua) and savings in expenditure on garden produce were judged to make a significant contribution to the household economy. Data from an FAO-supported project in the Niger promoting the production and consumption of vitamin A-rich foods among women's groups and their families showed that the proportion of healthy children increased in the project areas, in comparison with the non-project villages (IVACG, 1994). The successful ingredients of this project were: a strong emphasis on nutrition education to promote underutilized indigenous foods such as green leaves; the cultivation of traditional wild sources of vitamin A; and the use of food preservation and solar drying to address the problem of seasonal shortages. Available evidence clearly suggests that home gardening can result in tangible benefits for the household, including food on the table, extra income and healthy children. Access to home-grown fruits, vegetables, small animals and/or fish ensures a more balanced diet for rural families with limited purchasing power and increases their self-reliance. The sale of surpluses can provide direct benefits to producers, especially women farmers, and can also benefit consumers by increasing the quantity and diversity of food supplies in local markets. In communities where specific nutritional deficiencies persist or where there appear to be unexploited possibilities for income generation, households can with some support from government services or NGOs improve the diversity and productivity of their traditional gardens. Home gardening can also be a potentially important element in urban food security strategies. For home garden projects to be successful and sustainable, a number of important elements need to be considered. Since home gardening is a complex and varied production system forming part of a wider household economy, garden interventions to improve nutrition require a good understanding of local conditions so that project goals can be adapted locally. Thus it is necessary to work closely with local farmers, especially with women farmers, to identify resource and other constraints and locally appropriate ways to promote home gardens that are sustainable. To ensure that availability of garden foods translates into nutritional benefits for the whole family, nutrition education and information about nutritional value and utilization of fruits and vegetables in the diet are essential. Promotion of crop diversification requires flexibility regarding choice of species and cropping patterns, encouragement of diversity and cultivation of locally adapted varieties to enhance nutritional value, and attention to soil fertility, pest management, income-earning potential and genetic conservation. Involving women in all aspects of garden management and nutrition training is crucial, as women do most of the work and are responsible for family nutrition. Regular monitoring of garden progress, although costly, could help to resolve problems and to provide information quantifying gardening output and consumption increases; it could thus contribute towards inducing policy-makers and planners to direct more investment to the improvement of the home-gardening sector's output. Community organizing for gardening, preferably building on local farmers' and women's organizations, is also a clear prerequisite for sustainability of gardens in the long term. In urban areas the households most at risk of food insecurity and chronic malnutrition belong to the lowest-income groups which cannot afford to purchase adequate food. Many of these households comprise families of recent migrants who have failed to find regular employment. Their income levels are often so low that they can afford to purchase only the cheapest and most basic foods, and since they cannot afford to rent housing they are forced to camp in makeshift shanty towns on the periphery of cities. Such families often cultivate tiny plots of land within their household area and keep small livestock as a basic survival strategy. However, many of the better-established urban residents have also developed their own subsidiary food supply systems which support food purchase from the urban markets. Urban agriculture, like the street food trade, often tends to be discounted and frowned upon in official circles as a limited, transitory phenomenon practiced only by recent migrants, living in squatter areas, who have not yet adapted to a market economy. In contradiction to this view, a survey covering cities in a number of countries including Ethiopia, Kenya, Senegal, the United Republic of Tanzania and Uganda (IDRC, 1993) showed that urban agriculture makes a significant contribution to the food supplies of many major cities. A Zambian survey showed that urban enterprises can improve household food security, the variety of the diet and intakes of essential micronutrients (see Box 19 and Tables 28 and 29). Peri-urban commercial cultivation of high-value crops, including tomatoes, onions, green vegetables and fruit, is a growing food supply enterprise for a number of African cities. Such production systems can be very profitable, justifying their high costs in terms of inputs such as irrigation, fertilizers and pesticides. The proximity of production to urban markets is essential to ensure the freshness of such perishable commodities and their contribution of vitamins and minerals to urban diets. By practicing a diversified form of urban agriculture, poor urban workers are able to meet some of their nutritional requirements, especially those for minerals and vitamins, through the consumption of some of their produce. This capability is important, as marketed vegetables and fruits often tend to be too expensive for low-income urban dwellers. To encourage urban food gardening as a viable food security strategy, assistance is needed in many instances to provide better access to land, water, seeds, community-based extension services, nutrition education and markets. Surveys were carried out in low-income areas of Lusaka, which are made up of five types of settlement: two types of squatter areas (A and B), one of which (A) lacks even basic services; two types of serviced plots (C and D), one provided by the local authorities (C), and the other provided under a World Bank housing plan (D); and an area of official low-cost public housing (E). · rainy-season gardens, which are usually located on the periphery of the city, i.e. a type of urban allotment, dependent entirely on rain-fed production. Analysis showed that nearly 60 percent of the low-income households cultivated one or both types of garden (Table 28). The variety of produce from both types of garden is shown in Table 29. Source: Adapted from Sanyal, 1985.
a See Box 19 for definition of areas. b This estimate includes tenants living in low-cost housing areas. a Each column adds up to more than 100 percent because one household may cultivate more than one type of vegetable. Traditional food crops are those accepted by a community, through habit and tradition, as appropriate and desirable sources of food. People are accustomed to them, know how to cultivate and prepare them and enjoy eating dishes made from them. It is not possible to list traditional food crops, as distinct communities have evolved their own food preferences and habits. However, they fall in two broad categories: those consumed as traditional dietary staples, such as cassava, yam, plantain, sweet potato, millets and sorghum, and those that serve as ingredients in accompanying relishes and sauces, which include a wide variety of legumes, oilseeds, fruits and vegetables. Classically, in subsistence agriculture, farmers grew and used traditional food crops because the practice was familiar. They understood these plants, selected varieties to meet the needs and constraints of their environment and trusted seed from their own landraces to produce a reliable crop. Required inputs were low, family labour was available, and the seasonal demands of traditional plants fitted well into farming systems encompassing mixed cropping, shifting cultivation and bush fallow. There were social reasons, of custom or prestige, for the selection of a diverse range of traditional crops. Sorghum was needed to brew beer for meetings, weddings, births and other festivities. Cassava and bush greens were fall-back foods in the hungry season before the harvest and during the early rains. Cassava was left in the ground until needed, and sorghum and millets were stored in household pots and granaries. Melons kept well, and their seeds provided oil. Now many traditional crops are often scarce and expensive. In parts of Nigeria yam has become a luxury food. In Ethiopia the traditional cereal, teff, is increasingly used by the urban elite and better-off rural people to prepare the traditional dish of injera and wot, but it is expensive for the average Ethiopian. Given adequate markets and remuneration prices, many farmers are likely to increase their production of a great variety of traditional foodstuffs, contributing to a more diversified food supply and increased dietary choice. However, the food chain between producer and consumer is long and involves many different sectors of the economy, many communities and many individuals with specific interests. If it is in the interests of all involved to increase their production and consumption of traditional foods, they will do so. Traditional crops have numerous advantages, especially in terms of household food security (see Box 20), as they are particularly important in the cropping strategies and consumption patterns of poor people. They provide a varied diet, often rich in minerals and vitamins including vitamin A, iron and calcium. Nutrition-based arguments, however, are not always the most persuasive, unless they are augmented by more material concerns such as economic benefits, convenience and palatability. Returns to labour in the production of traditional food crops must be seen to be advantageous compared with farming of cash crops if their production is to be promoted. In a traditional subsistence economy, where there is mutual support and security, the appeal of traditional food crops is high and obvious, but changing to a cash economy and the purchase of processed food alters the food system. Roles change, and with them the type and amount of foods grown for domestic use, for social use and for sale. Changes, however slight, may disrupt daily household routines. The domestic processing of traditional grains is labour intensive; when time is short women prefer wheat bread, rice or maize which are easier to process. Some 50 000 vegetable food species are known to exist worldwide, yet humanity uses no more than 200 of them. In view of the food scarcity in many developing countries, this proportion is not only insufficient, it is also ecologically and nutritionally dangerous. It is time to rediscover forgotten and neglected food plants and to broaden the food base using significantly more of the available resources. The nutritional value of diets is enhanced by traditional legumes, oilseeds, fruits and vegetables. They add taste and flavour to the diet, improve palatability and help to balance protein, vitamin and mineral intakes. Vegetables and fruits supply provitamin A, vitamin C, iron, calcium and many other micronutrients. In Africa, an estimated 80 percent of vitamin A and more than one-third of vitamin C are supplied by traditional food plants. Nuts and oilseeds are also good sources of protein and energy, valuable supplements in children's diets and useful in preparing snack foods. Seasonal food scarcity accentuates the severity and incidence of malnutrition. To see them through the so-called hungry season, rural people grow traditional food plants near their homes using available family labour. Many of these plants are drought resistant, can be grown without expensive inputs and have good storage qualities. For example, root crops such as cassava can be grown as a food reserve, left in the ground for up to two years and used as the main source of energy during lean times. Many traditional food plants make an important contribution to crop productivity. Grown as rotation crops between successive main crops, they have the advantage of reducing the buildup of pests and diseases. When interplanted, they may act as an ecological barrier to disease. By acting as ground cover, traditional food plants also help to prevent soil erosion, reduce evaporation and suppress weed growth. Grown as green manure and ploughed in, traditional plants can increase soil organic matter and improve soil structure. In addition, legumes fix atmospheric nitrogen, enriching the soil for the following crop or for nearby plants. Traditional food plants benefit both producer and consumer. The producers - mainly women -increase their families' consumption and generate income by selling the surplus in local markets. Thus, they make more varieties of food available to consumers at lower cost. Generally, women use this income for improving the nutrition and welfare of their children. Many food-deficit countries are forced to import large quantities of food to meet local production shortfalls. At national level, payments for food imports have become an increasingly heavy drain on the scarce foreign exchange resources of many countries. Increased production of a range of traditional crops, particularly staples, will increase food supply and thus contribute to reducing food imports. Development for the urban market of low-cost, ready-to-eat products and other convenience foods based on domestically produced traditional food plants will stimulate increased consumption of, and demand for, these foods. 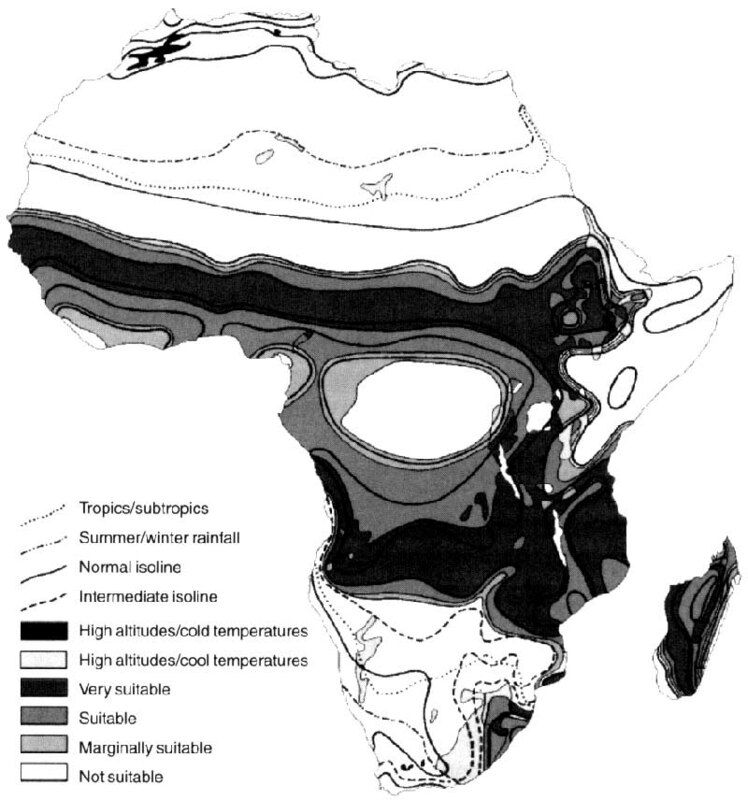 Source: Adapted from FAO, 1988d. Many traditional food plants are high in fibre, and some contain antinutrients such as cyanogenic glycosides, phytates, oxalates and enzyme inhibitors. These factors all reduce the big-availability of essential nutrients. Many antinutritional factors can be removed or rendered ineffective by appropriate processing, preparation and cooking. Similarly, the nutrients present, especially vitamins A and C and vitamins of the B complex, can be better conserved through appropriate handling or the use of improved techniques for drying and preservation. Effective processing, however, can often take considerable time, and women's time is limited by a multitude of domestic and other obligations. The use of traditional underutilized crops by poor farmers and their consumption by disadvantaged farm families attaches the image of "poor person's food" to plants such as beans and green leafy vegetables; they are seen as foods to add to the sauce when the family cannot afford meat. This stigma makes it difficult to promote such plants. In addition, some food crops, often the traditional ones, may be known as "women's crops", which gives the impression that it is only women who are keen to promote traditional food crops. In Zimbabwe, women's crops include groundnuts, cowpeas and bambara nuts (Voandzeia subterranea). These crops are grown on small field plots in the same farm area as the main cash or food crop, maize, but they receive little or no fertilizer or manure and are produced with the farmers' own seed. Under such circumstances, it will be difficult for traditional food crops to regain their earlier popularity in terms of production and consumption levels. The changing food demand patterns of urban populations have had adverse effects on the consumption of minor crops in general, and traditional staples in particular. Presentation of improved, convenient forms of these foods, and especially the development and marketing of a wide range of snack foods based on them, will help to improve demand and restore their image. This strategy will also most likely increase the earning capacity of women, who are largely responsible for the preparation and marketing of street foods. Perhaps, as already discussed, the best strategy for the promotion of traditional food crops is to provide support for the development and improvement of mixed cropping systems together with promotional programmes for selected crops. This support should be augmented by the introduction of technologies to reduce risk and increase yield, especially for poor farmers in marginal areas, where traditional crops usually make a major contribution to the food supply. In such areas, gathered foods and the produce from home gardens also contribute significantly to household food resources and to the income of women. Technologies and household techniques are also required to improve the nutritional value of food and to make post-harvest processing less laborious and time consuming for women and others involved in processing activities. The adoption of mixed cropping practices in traditional farming systems has been discussed above. One of the interventions that could improve the productivity of such systems, with potential to improve farming incomes, is the introduction of new crops for which market demand can be developed. Provided they are compatible with ecological conditions and constraints, crops already grown and utilized in farming systems elsewhere within and outside the African continent could be considered. The programmed introduction of soybean into African smallholder agricultural production and subsequently into the food system is an interesting example of such an intervention. The availability and consumption of dietary oil in Africa is generally low, especially among the poorest sectors of the population. In production terms, the introduction of soybean in Africa is promising. Its contribution to dietary diversification is also receiving considerable attention, as it contributes excellent quantities of both protein (35 to 40 g per 100 g) and fat (approximately 20 g per 100 g). Soybean has a very good nutritional profile in comparison with other legume crops (see Tables 22 and 24), and an enormous area of Africa is suitable for its cultivation (Figure 20). Especially in view of the worrying declines in world legume production, accompanied by accelerating prices of this crop which has always supplied a major proportion of poor people's protein, the promotion of soybean in combination with other food legumes deserves serious consideration. In the early 1970s, the International Institute of Tropical Agriculture (IITA) in Nigeria began a soybean production research programme and developed soybean varieties that grew well under the prevailing ecological conditions. However, consumer acceptance of soybean, unlike that of rice or wheat, was initially not very high except in one or two states where soybean had been introduced in the 1940s by British colonialists and where local uses, e.g. as a fermented condiment, had been developed. In 1987 IITA conducted a baseline survey on soybean production and utilization in three rural communities in Oyo State, Nigeria. The survey revealed that consumer resistance to soybean consumption at household level arose from lack of information on the correct processing and cooking methods for this new bean. Subsequently, improved techniques were developed and disseminated to enable consumers to prepare an acceptable soybean flour for inclusion in traditional dishes such as egusi soup, usually made with melon-seed flour, and snack foods such as bean-balls (akara), normally made from cowpea flour. The adoption rate of soybean products was highest for the egusi soup recipe, as soybean flour was cheaper than melon-seed flour, and for soy iru or dawadawa, a type of stock cube or soup flavouring traditionally prepared from locust bean seed (Parkia biglobosa) (Table 30). Ease of preparation and comparative cost were the main criteria for adoption of the soybean products. This case-study emphasizes the need, before the introduction of a new crop, to examine the whole food supply system from production to consumption and to ensure the acceptability of consumer products so as to provide market incentives for growers of the recommended crop. Through practical training sessions at nutrition centres in Oyo State, mothers of undernourished children have learned the effectiveness of soybeans in supplementing children's diets to prevent and combat malnutrition. They have also learned how to incorporate soybeans into local dishes and how to grow soybeans in their gardens for home use (E.A. Kueneman, personal communication). In Zimbabwe, and increasingly in Zambia and Malawi, soybean is being introduced not only into farming systems at the commercial level, but also into the cropping systems of small-scale farmers, as a rotational crop to follow wheat or maize. In Kenya, commercial sugar-cane companies have finally allowed farmers to intercrop legumes, including soybean, with sugar cane and are now providing certified seed for this programme. Soybean is grown intercropped with cassava and even citrus fruit when low plant populations permit penetration of light to the understorey soybean crop. Recommendations on introducing soybean into maize and cassava cropping systems are available from the IITA Grain Legume Improvement Programme (Post Box 5320, Ibadan, Nigeria). Extremely easy to prepare from whole soybeans and tastes very good. Soybean is cheaper than melon. Keeps well. Dehulling makes preparation time consuming. Hot extraction of milk hurts the hands. Milling process is difficult. Cannot keep for a long time. Soy paste cannot be used alone as can that made from cowpeas. Same as for soy moinmoin. It disperses into the oil. Easy to prepare and tastes nice. Tastes better than eni from locust bean iru. Easy to prepare and quite cheap and available in comparison with iru from locust bean. · It fits into the main cropping systems of both commercial and small-scale farmers, and it can contribute to the productivity and sustainability of these systems. It is, at present, the most adapted legume crop for inclusion in most cereal cropping systems, except where rainfall is very low. · It is a profitable cash crop when linkages are established between farmers and processors, and it is also becoming accepted as a local food crop. It provides the raw material for a wide range of agro-industries, including oil extraction and animal feed. · It yields more protein per unit of land than any other commercial crop. Thus its promotion is the most cost-effective way of producing large quantities of protein for both human and livestock consumption. · It has potential for fortification of the diet of rural populations, through the addition of soy flour to cereal flour and to root and tuber flour dishes. · Its nutritional attributes, particularly its high protein and fat content, endow it with the greatest potential for cost-effective improvement of weaning diets and thus for substantial reduction of levels of protein-energy malnutrition, which is a public health problem in many African countries. At present, many commercially produced soybean products, including maize/soybean drinks and soy-fortified flours and weaning foods, are priced beyond the reach of poorer families. In order that the potential contribution of soybean to African diets may be realized, greater use at household level is being promoted, based on existing cultural practices and food habits (see Table 30). It will also be important to increase production and to promote community-level processing technologies. The case of soybean underlines the need to create awareness within the consumer sector before introducing unfamiliar food or cash crops to small-scale farmers, in order to realize the full nutritional benefits of the new foodstuff at the household level (see also Chapter 9, on nutrition education). In all societies, food is selected and prepared not only to satisfy hunger and to fill the stomach, but also as a source of pleasure, pride and display. Dishes prepared from animal sources are among the most prestigious and preferred foods and are served to honour guests, to celebrate births and to mourn the dead. Daily meals, however, in the majority of African households, contain only a relatively small amount of food from animal sources. Animal foods are not regularly served as a main component of meals, as they tend to be too expensive for regular use by the poorer sectors of the community. Often, animal products can only be used to add flavour to soups, stews and relishes. Many extension agencies have promoted increased household involvement in the rearing of small livestock such as pigs, goats, sheep, rabbits and poultry (usually chickens) in Africa with the aim of increasing the amount of protein from animal sources in the household diet. Animal foods are also valuable sources of micronutrients, making a substantial contribution to the control and prevention of micronutrient deficiencies. Meat and meat products are generally excellent sources of iron. Animal products such as eggs, milk and liver are particularly good sources of vitamin A. Of the meats, sheep has the highest vitamin A content (20 mg per 100 g meat), while the meat of fowl also provides a valuable amount. Animal foods are consumed infrequently by many families in rural areas, as animals represent a considerable investment for a poor community. They are often regarded as a form of insurance policy, to be traded for cash when times are hard and to be sacrificed for food only on special occasions. Eggs, the output of poultry, are consumed domestically, but they are also often marketed by poorer households to generate cash, and the cash may be valued much more than the nutritional advantage of eating eggs. Another useful by-product of domestic animals is dung, which can be returned to the household garden as manure. However, dung is only readily available if the animals are confined, which usually implies stall feeding, a form of livestock rearing that often involves additional expenditure that most low-income households cannot afford. In addition, animals reared in free-range systems often feed among crop residues in the fields. Thus the benefits of using domestic waste or crop residues to fertilize the home garden are not forthcoming in situations where people cannot afford to practice stall feeding. In many poor communities goats, chickens, sheep and even pigs are free to range. The animals forage around the village area in the daylight, often returning to their owner's compound only at dusk. The maintenance cost of such animals is low; any gains in terms of eggs or progeny may therefore be regarded as profit, to be marketed when cash is needed. Beef or milk cattle are in a different class, however. They are regarded as a more valuable asset and are therefore supervised more closely and fed better and more regularly. Whether or not their output, such as milk and milk products, will he used within the owner's household depends on a number of factors, such as culture, tradition, preference for these foods in the diet, availability of markets, need for cash and understanding of the family's nutritional needs. In pastoralist societies dairy products may form the basis of the diet, but in other areas of Africa where cattle production is restricted to local tsetse-resistant breeds such as the N'Dama this may not be the case. In such areas, the use of milk products is limited by tradition, custom and availability. The milk yield of local breeds is often very low, and it is even lower if the animal is inadequately pastured. In most "backyard" cattle-keeping situations, the calf is allowed to suckle freely until it is weaned and it becomes a valuable asset. The cow is then left to dry out until her next pregnancy and parturition. Women often have the primary responsibility for small animal husbandry (e.g. the raising of goats, sheep and chickens) and the preparation of products from animals (e.g. cheese, butter, yoghurt). It is usually women who decide whether to sell eggs and other products or to use them for home consumption. When these products are sold, it is because cash is badly needed. The price of these foods, especially in urban areas, is usually high and beyond the reach of poor consumers who may be suffering from nutritional deficiencies. Fish has an important role in world protein supplies, particularly in developing countries. Besides protein, fish provides energy, essential fatty acids from fat, vitamins and minerals. Fish species vary considerably in composition as well as in size and appearance. Marine fish are slightly more beneficial than freshwater species by virtue their higher iodine content. It was estimated that in continental Africa (excluding South Africa), 21 percent of the animal protein consumed came from fish and fishery products in 1990; this figure had remained stable since 1970 (FAO, 1992c). It is often difficult to increase the availability of fish at affordable prices. Promotion of consumption is mainly relevant when low-priced fish is sufficiently available. Aquaculture is practiced throughout the world; in the tropics it is probably most extensively developed in eastern and southeastern Asia, where animal protein consumed from fish and fishery products was estimated at 29 percent in 1990 (FAO, 1992c). Fish farming includes the production and rearing of fish in freshwater ponds, in the brackish water of mangrove swamps or in tanks and cages. In all cases the intent is to provide a regular, controlled supply of desirable species to supplement irregular quantities obtained from fishing. There are also some prospects for community-based aquaculture as pan of the household farming system. A practical guide for extension workers, technicians and teachers, the Handbook on small-scale freshwater fish farming (FAO, 1994d), is available from FAO. Fish selected for farming must be able to breed and thrive under artificial conditions of environment and diet. Some freshwater species are overprolific in captivity; Tilapia nilotica, for example, breed more rapidly than they grow. Under conditions of confinement, individual fish attain maturity at a much smaller size than they would do under natural conditions. Thus at harvest time they are unacceptably small, with a high proportion of bone in comparison with flesh. Several techniques have been developed to overcome this problem of overpopulation. These include predator control, monosex culture, all-male hybridization and cage culture. Box 21 summarizes some aspects of fish production, harvesting and consumption in the North-Western Province of Zambia. Seasonal competition for labour and inputs was particularly noted as a constraint to increased production, and about two-thirds of the fish consumed still came from outside the household. Production from fish ponds is low; in most cases 3 to 6 kg per pond are harvested annually. Semi-commercial farmers produce more fish than subsistence farmers; motivated by their higher returns, they expand farms more often, using their own means. New ponds, however, are smaller and have a shorter life span than the ponds built with subsidies provided by externally funded projects in the 1980s. Ponds are inadequately fertilized. The main reason is scarcity of manure. The available manure is applied both to fish ponds and to vegetable gardens, mainly during the cold, dry season, not during the warm, rainy season when the fish grow. Seasonal shortage of labour to collect and apply manure is one reason. Semi-commercial farmers have better-manured ponds than subsistence farmers, the most apparent reason being their more numerous farm animals (cattle, goats and chickens). Integration of ducks with fish farming, or any other method of pond fertilization, is not practiced. For feed, fish farmers use exclusively on-farm products which are basically identical to the main relishes of the households. There is no difference between the two types of farmers in this respect. Cassava leaves in particular are used as fish feed. In the rainy season, greens are scarce and there is competition over their use. Feeding decreases considerably in quantity and frequency, and may for some farmers completely cease for a period before the rains. Semi-commercial maize growers have an advantage over subsistence farmers, through their access to maize bran as complementary fish feed during the dry season. Two harvesting strategies are practiced: major and intermittent harvesting. Major harvests are carried out either with the assistance of extension workers who bring seine nets or by the households themselves using baskets managed by women. The average period between major harvests assisted by extension workers is 17.3 months. Nearly one-third of any major harvest is consumed by the household or given to relatives and friends for consumption. The rest is used for sale (30 percent) or paid to people in exchange for work (20 percent) or for assistance during the fish harvest (20 percent). Fish farmers ensure a local supply of broodstock and fingerlings either by not draining the ponds during the harvest or by taking some fish aside to be returned to the ponds after completion of the harvest. Virtually all farmers practice intermittent harvesting, mostly with hook and line (children), followed by baskets (women). The proportion of fish removed by intermittent harvesting in relation to the amount removed in major harvests is twice as large for subsistence farmers (41 percent) as for semi-commercial farmers (21 percent). Fish taken out intermittently is used exclusively for household consumption. Consequently, cultivated fish has a greater significance as an additional food source for subsistence farmers than for semi-commercial farmers. Most fish consumed, however, derive from outside the household (60 to 70 percent). Fish is considered the most important source of animal protein. It is consumed more than once a week in quantities that appear to change little over the year. Fish farming has had two major implications for the households: one is that consumption of fish has gone up, the other is that cultivated fish has reduced purchase of fish (thereby reducing cash expenditures); it has also reduced the catches of fish in rivers and streams by household members, thereby preventing overfishing. Sale of fish is in most cases the responsibility of women. Prices vary, depending on proximity to "urban" markets. Because of the meagre quantities harvested, returns (at June 1989) rarely exceeded 100 to 200 kwacha (US$8 to US$16) annually. There are some exceptions. Source: Adapted from FAO, 1993e. Processing of fresh fish (primarily drying and smoking) and marketing are often managed by women. In West Africa, smoked fish is a component of many traditional dishes. Proper smoking improves the keeping quality of dried fish and can also increase its acceptability. Education about the strict hygienic practices required in handling fish should be provided to fish traders (usually women) as well as to their clients. If food purchasers (who also tend to be female) are unaware of the health advantages - from improved food quality and safety - of fish sold on ice, they may be unwilling to pay more for it. Health and nutrition education should therefore often accompany fish promotion. The influence of small-scale pond aquaculture on household food security, food consumption patterns and the nutritional status of children was examined in the Bembeke and Chinyama areas of Dedza District and in the Tsangano area of Ntcheu District, both in the central region of Malawi (Costa-Pierce et al., 1990). Data on household characteristics, frequency of consumption of different types of food, beliefs and knowledge related to fish consumption, aquaculture practices and incidence of water-borne diseases were collected using a scheduled and pre-tested questionnaire. It was concluded that fish farming could play a major part in enhancing household food security and nutritional status. However, it is essential to provide better education and extension on both fish farming and its potential role in nutrition, as well as low-cost harvesting tools, if small-scale fish farming is to be both sustained and expanded in Africa. In addition, aquaculture entails potential health risks such as the breeding of mosquitoes in open standing water and the spread of schistosomiasis, a water-related parasitic infection that affects some 30 million people in Kenya, Malawi, Nigeria and Zambia (WHO, 1 995a). The risks should be assessed, and appropriate measures, such as controlling the breeding of snails and mosquitoes in ponds and keeping ponds clean from human waste, should be taken to control and prevent the spread of diseases. In several countries of eastern and southeastern Asia, most notably China, intensive household food production systems have been developed in which crop production is integrated with the production of poultry, especially ducks, and small livestock, particularly pigs. Such systems often include fish production from family fish ponds. A number of attempts have been made to transfer integrated crop/ livestock systems to the African context to improve the productivity and household food security of small-scale farming units. The most notable of these interventions have been supported by the interregional Aquaculture for Local Community Development Programme (ALCOM), which has initially concentrated on nine countries: Angola, Botswana, Lesotho, Malawi, Mozambique, Swaziland, the United Republic of Tanzania, Zambia and Zimbabwe. Some areas of activity of ALCOM are described in Box 22. One of the basic differences between Asian and African systems for the management of poultry and small livestock lies in the degree of restraint of the animals. In many of the intensive production systems adopted by farmers in Indonesia and China, the pigs and poultry are confined and fed on a regular basis. This does not usually happen in subsistence farming practice in Africa, where animals and poultry usually subsist on what they can find around the houses or among the crop residues in the fields and are confined only at night. In such systems, crop residues and animal manure are not usually collected on a daily basis, nor are they systematically utilized to fertilize gardens and fish ponds or to prepare mulch and composts. In introducing an integrated crop/livestock/fish management system into an existing farm economy, changes must be made in the allocation of assets, time and labour. Even when the required inputs may be available on the farm as by-products of existing crops and livestock, farmers will not necessarily allocate them equitably among alternative outlets, unless they consider it in their interest to do so in terms of their investment of cash, time and labour. Table 31 shows the extent to which farmers in Zambia allocated agricultural by-products to the feeding and fertilization needs of their household fish ponds. Intensive integrated management systems require regular inputs of household labour and usually entail some purchased inputs such as feed for poultry, fish and small livestock. Small-scale subsistence farmers often have very limited assets and are unwilling to risk credit unless the returns are both guaranteed and relatively attractive. It would be unrealistic to support an increase in fish pond production if the farmer would have to divert fertilizer to fish ponds when it could be more productively and profitably utilized in crop production. If the family pond can be constructed in the vicinity of the household garden, it may serve as a source of irrigation water for vegetable plots during the dry season. Such integration between fish and plant production systems can increase land productivity and help to stabilize food supplies at the household level. · Review information on major farming systems in the region, and experiences in other regions. · Carry out in-depth studies of selected mixed farming systems in the region. · Identify possible aquaculture systems in relation to the main farming system. · Study comparative returns from crops, animal husbandry and fish culture. · Study the social impact of integrating farming with aquaculture - particularly the impact on male-female roles and the nutrition of children. · Monitor social, economic, technical and environmental factors. · Review current documentation on the work and roles of rural women and youth. · Carry out in-depth field studies in at least two countries or cultural settings in the region at the village and household levels. · Suggest ways of solving management problems concerning the role of women in fish pond operations. · Try out participatory ways to monitor and evaluate methods to involve women in integrated farming systems. Many small reservoirs exist in rural areas of southern Africa. They generally have multipurpose uses - such as domestic water supply and irrigation. They are often controlled by government institutions. Fish production is not usually a primary function. ALCOM aims at developing, testing and demonstrating methods to improve production and distribution of fish in such reservoirs and other small water bodies in rural areas. Some proposed activities:. · Carry out a survey of dams, which covers, inter alia, biological and physical parameters, management strategies, community orientation and socio-political issues relating to reservoir use. · Identify methods to improve fish production in specific small reservoirs and to solve community problems concerning their implementation. a Number of owners reporting: Mansa, 12; Kawambwa 15; Samfya, 9; Total, 36. Forests and trees provide foods that supplement and complement traditional agricultural sources. However, nutritionists and foresters have until recently paid insufficient attention to forest foods. In many parts of the world, non-wood forest products (NWFPs), defined as "goods of biological origin other than wood, as well as services, derived from forests and allied land uses" (FAO, 1995a), have an important biological and social role in local food systems. They can contribute substantially to nutrition, either as part of the family diet or as a means of achieving household food security. They can also improve health through their role in prevention and treatment of diseases. Poor households residing in and around forest areas. and particularly landless people, women and children, depend to a varying extent on the exploitation of common-property forest resources in daily life or in periods of crisis. Forest foods can constitute an important element of sustainable diets. They can broaden the food base and diversify the diet, thus preventing nutrient deficiencies and ensuring dietary balance. They come from locally available natural resources which are part of or compatible with the local ecosystem. NWFPs also contribute to household food security and health. Wild leaves and fruits contain many essential nutrients. Seeds, nuts, roots and tubers found in forests supply fats and carbohydrates. Mushrooms, gums and saps provide protein and minerals. Wild animals from the forest often supply most of the meat consumed by people living in or near forest areas. Other forest resources have a major role in the economy of many households, not only contributing food, but also providing timber for building, fuelwood and inputs for agricultural production, as well as generating income, thereby contributing to household food security. In some communities in Swaziland it was found that wild leaves supply as much carotene, vitamin C, calcium and iron as leaves from cultivated plants, and that 48 varieties of leaves were used by half of all adults. Children in lowland Kenya and Swaziland snack on forest foods which provide an important supplement to their diet, especially during cold months. In West Africa, from the Gambia to Cameroon, the seeds from locust bean (Parkia sp. ), a perennial tree legume, provide a nutritious protein- and fat-rich food known as dawadawa or soumbara. Annual production figures are difficult to obtain, since locust bean does not enter regular commercial trade, but a 1980 estimate suggested that 200 000 tonnes of beans were gathered in northern Nigeria every year (Campbell-Platt, 1980). Home gardens combining trees and horticultural crops are an important form of agroforestry and provide a substantial amount of total dietary energy consumed by some farming communities. In southeastern Nigeria, traditional compound farms can contain more than 60 species of trees that provide food products (Okafor and Fernandes, 1987). Forest foods are extremely important because they are frequently available to tide households over hungry seasons when other food crops are in short supply. NWFPs have not received the required attention in development planning, and forest foods are overlooked in most nutrition programmes. Foresters have a major role to play in the promotion of NWFPs, and this role should not be limited to the design and promotion of sustainable exploitation techniques. It is increasingly recognized that the forest should be seen as a dynamic system and that the needs of indigenous people, and particularly their household food security and nutritional well-being, should be taken into account in discussing productivity and environment. The promotion of NWFPs should not be seen, however, as the sole responsibility of forest departments. All government and NGO development workers operating in or near forested areas, and particularly agricultural extension workers and health staff, should be made aware of the present and potential contributions of NWFPs and should be involved in a concerted effort to promote household food security and improved nutrition of the local population on the basis of existing resources. The development of technological research and quality standards and the design of communication strategies for consumer information will be particularly important for the successful marketing of forest foods that have economic potential. Seasonality is a major barrier to obtaining the benefits of fruits and vegetables, especially in tropical countries. Horticultural products mature during a short season, most of them simultaneously, in quantities much higher than local markets can absorb. Low prices during the harvest season cause farmers to refrain from selling their produce; as a result considerable amounts go to waste. Drying of nutrient-rich foods (e.g. mango and green leaves) can improve the nutritional status and income of families, since dried foods can bring a good market price. In many African countries, from the Niger to Zambia, women use solar drying techniques for fruits, vegetables, mushrooms and tubers which contain important quantities of vitamin A and iron (Boxes 23 and 24). The sale of these products at local markets provides valuable income. Mango leather (concentrated mango pulp in sheets), often sold by women on the street, is being introduced for schoolchildren in the Niger. Practical information on preserving techniques and the construction and use of solar driers is contained in the FAO publications Rural processing and preserving techniques for fruits and vegetables (FAO, 1988e) and Fruit and vegetable processing (FAO, 1995c). Preservation is also discussed in Chapter 6. In Mantapala nearly all households preserve some local vegetables at the end of the rainy season between February and May. However, stocks vary, and for some people stocks of preserved vegetables begin to run out as early as May. The main method of preservation is sun drying, and the most common local vegetables that are preserved include bean leaves, pumpkin leaves, cowpea leaves, mulembwe, mankolobwe and mushroom. Preservation of local vegetables is increasing as other sources of relish, in particular local game meat [monkeys, duiker and holybeg (small goats) and water buck], are becoming less plentiful. Since ancient times the most common method of preserving fruits and vegetables, as well as meat and fish, has been sun drying. Reducing the moisture in food prevents the growth of microorganisms that cause foods to decay. At the same time enzymatic and biochemical activities are practically stopped or reduced to very low levels. Foods preserved by drying can be kept at ambient temperatures for long periods and provide nutrients when fresh produce is not available. Open-air sun drying has disadvantages, such as infestation by insects, contamination from dirt, rodents and birds, and spoilage from occasional rains. The use of solar dryers, an alternative to sun drying, provides the benefits of higher air temperature and continuous air flow which substantially improve the drying rates. This results in a higher-quality product. Since closed cabinets are used for solar drying, the product is more protected. The solar dryer is based on the principle of absorption of heat from solar radiation by a black surface. The temperature inside a solar dryer can be maintained at 60° to 70°C, which minimizes the damage to vitamins and other nutrients. Recent results obtained in the laboratory by using high-pressure liquid chromatography (HPLC) to separate the carotenoids show that carotene retention after solar drying is around 40 to 80 percent depending on the product, which is much higher than retention following traditional methods of drying. For example, fresh cowpea leaves have 2 435 µg retinol equivalent (RE) per 100 g while solar-dried leaves have 2 071 µg RE per 100 g. Leaves dried in the traditional manner had only 847 µg RE per 100 g.
Solar dryers do not require sophisticated building materials. A family-type solar dryer can be built for as little as US$10, while the price of a community-sized dryer, which can be used by all members of a village, may reach US$250. Two of the most important factors to consider in adopting any policy for food diversification are the acceptability of the output and the availability of markets for the surplus. Many small-grained cereals are nutritionally advantageous in terms of protein quality and have ecological advantages in terms of reliability of production under conditions of low inputs and poor distribution of rainfall. However, they are difficult to process in comparison with maize or rice, and although technology has been developed for mechanical processing using abrasion milling, this possibility is not often readily available at village level. Other introduced foods, such as soybean, may initially meet with acceptability problems. In such cases a comprehensive programme of consumer education is needed to create a sustained local demand. The availability of markets for an increased flow of a wider variety of foods must also be ensured. For soybean, markets can be secured by promoting the use of locally grown soybean in feed products as well as for food uses, including oil extraction. Similarly, chipping and drying cassava for feed use can help stabilize market prices and stimulate production increases. Governments, and more particularly local authorities, can facilitate marketing services by allocating infrastructure for local markets. Such markets can provide an assembly site where farmers can sell their produce to traders for onward transport to urban markets. Local markets are also important as food sources for rural agricultural and non-agricultural labourers, artisans and the rural poor. Market improvements can have a positive benefit on rural poverty alleviation and food security. Labour requirements are another factor that should be carefully assessed when introducing new crops or production systems, such as home gardens, into a community. The labour consideration is especially important in regard to women's time and the investment of available resources into other activities with a comparatively greater advantage. For example, if the major objective of an intervention in a food diversification strategy is to improve the nutritional status of women and preschool children, in some circumstances this could be achieved most effectively by reducing the work burden of women through the provision of a new well and a grinding mill before trying to establish home gardens or to grow more millet. Thus it is helpful to understand fully the existing production processes and the gender division of labour and to appreciate the perceptions, priorities and constraints of the producers and the consumers through community participation in the planning stages of the proposed strategy. Often, the major interest of the producer is in securing a regular market and making maximum profit The marketing of fruits, vegetables and other horticultural outputs presents special problems because of the fragile and perishable nature of the produce. One way of avoiding surpluses for some crops is to stagger planting dates, where it is possible to do so. Extension services have a crucial role to play in providing appropriate crop, storage, marketing and consumer information tailored to the needs of groups of farmers and consumers. Good extension and marketing officers will listen to farmers in order to understand the constraints of the production area in terms of inputs, suppliers, transporters and buyers (Figure 21). They will also gain knowledge of what the customer wants by talking to intermediaries, wholesalers, market traders and urban consumers (see Figure 22). It is often said that food habits are difficult and slow to change; this may well be so if change is a voluntary act. Food has important psychological associations with family, community and security; familiar food is satisfying and reassuring, particularly the traditional foods of childhood which often evoke a deep-seated emotional response. Yet for many African countries, the past three generations have experienced extensive changes in family food supplies and in the household diet. In some urban areas, introduced foods now predominate: the accepted staple is maize flour, rice is the preferred cereal, and wheat-flour bread is a much sought-after luxury. Even in rural areas, the range of traditional domestic foodstuffs has been considerably reduced. FIGURE 22 - What produce does the customer want? People eat what they like, what is available and what they can afford. When traditional foods become scarce and expensive, and when time and labour are no longer available for their production, processing and domestic preparation, their contribution to the family diet is reduced. Do people still like and want traditional foods? There is evidence that they do, despite urbanization - or perhaps because of it. As described in the discussion of urban consumption patterns in Chapter 4, the products typically sold in some African city streets are largely traditional dishes and local food items. Accordingly, a campaign to diversify consumption patterns may well build on these preferences in the search for outlets and markets for a greater variety of crops. The message to diversify the diet should be supported by a government campaign to diversify the meals provided in schools and colleges, in hospitals and at work sites through foreign subsidy and/or encouragement of the sale of traditional dishes, including an increased variety of snack foods. The provision of clean facilities for food vendors at such sites would help to reassure the more influential and affluent consumers that the prepared foods are safe and would encourage such consumers to set an example by purchasing them. Nutrition information and education are needed so that people can make informed choices about the foods they grow, purchase and eat. Indeed, the success of food-based strategies to eliminate nutritional deficiencies will rest on the willingness of individuals to change their dietary habits. However, information and education must go beyond issues concerning individuals; they should also include social, economic and political factors that influence food patterns and choice by population groups. Attitudes towards breastfeeding illustrate the effects of society on nutrition. Breastfeeding not only provides all of the nutritional needs of the infant in the first four to six months of life, but also protects the baby from illness, both during breastfeeding and after the baby is weaned. Poor weaning diets with too much bulk, too little variety, too much water, too little protein and too few micronutrients will jeopardize the child's development and nutritional status. Efforts to ensure mothers' good health and nutritional status are a must for preventing micronutrient deficiencies in women as well as in newborns. Where social influences are reducing the length of breastfeeding, teachers, health workers and extension workers should be encouraged to support breastfeeding and appropriate weaning practices. Since women are usually the most responsible for food within a household, nutrition education is primarily addressed to them. However, male household members also influence which foods are consumed, as often they control the bulk of family income. Nutrition education and training should be given to men and women and introduced into the curricula of teachers' training colleges, primary and secondary schools, agricultural schools and universities. The use of mass media such as radio and television is also gaining increasing importance for informing and educating the public on nutrition and healthy lifestyles. Nutrition education is covered more extensively in Chapter 9.